" I was on board for a re-imagining of the Snow White fairy tale. Unfortunately, the film's lack of imagination caused me to jump ship. The uneven pacing, uninteresting dialogue, and uninspired action all make for one big missed opportunity. " 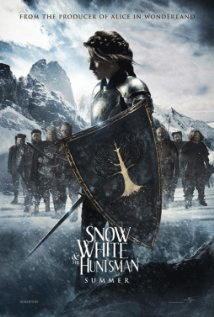 In a twist to the fairy tale, the Evil Queen (Charlize Theron) is supposedly jealous of Snow White (Kristen Stewart) and thus orders the Huntsman (Chris Hemsworth) to search for her in the black forest so that she can be killed. However, he soon learns the queen will not keep her bargain to bring his wife back from the dead. Therefore, he becomes Snow White's protector and joins her in a quest to kill the Evil Queen. Boredom ensues. Underwhelming. Aimless. Disappointing. All words that I’ve heard my grandmother use to describe my Uncle Larry’s life. But these words also convey the snooze-inducing experience of watching Snow White and the Huntsman. Centered on the implausible – and downright laughable – premise that Kristen Stewart is fairer than Charlize Theron, Snow White lumbers out of the gate at such a slow pace that my interest was immediately disengaged and I soon found it hard to stay awake. The film is peppered with moments of action and fight scenes, but the pacing remains uneven throughout and viewers ultimately receive nothing more than false hope that the story will eventually come alive. The main problem with this is that all the trailers I had seen were action-packed and promised a dark and thrilling adventure. As such, they certainly served their purpose – I was convinced to pay to see this on the big screen. Unfortunately, the 2 1/2 minutes of jam-packed action we’re treated to in the trailers is spread throughout two hours of runtime, leaving a whole bunch of wandering filler. It’s a shame because I was on board for a re-imagining of the Snow White fairy tale. Unfortunately, the film’s lack of imagination caused me to jump ship. The uneven pacing, uninteresting dialogue, and uninspired action all make for one big missed opportunity. Sure, the cinematography is easy on the eyes, and the special effects provide a little fun, but overall the film gives us no real substance, and to be honest, not enough style to compensate. Theron is great as the Queen. Despite a few moments of some voracious scene-chewing, she takes the role seriously and gives it her all. Stewart, on the other hand, does what she does in every movie I’ve ever seen her in – act like Kristen Stewart. Therein lies a major problem with the story’s narrative – Theron is more convincing as the antagonist than Stewart is as the protagonist. She gives a big speech near the end of the film that’s meant to inspire her friends – and I suppose the audience – as she sets to do battle with the Queen, but all it inspired within me were a few giggles. The fact that her pulled back hair and chain mail makes her look like a 10-year-old boy dressed up as a knight for Halloween doesn’t exactly make her any more convincing. Snow White and the Huntsman isn’t a terrible movie and it has a few shining moments, but it is terribly unbalanced and the shine quickly fades. You’d be wise to wait for it to hit Redbox or Netflix. Viggo Mortensen and Hugh Jackman both turned down the role of the Huntsman. Kristen Stewart accidentally punched Chris Hemsworth during filming giving him a black eye. Hemsworth retaliated by hitting Stewart in the head with a gigantic hammer, giving her a concussion. Charlize Theron is in In the Valley of Elah with Josh Brolin who is in Hollow Man with Kevin Bacon. Rated PG-13 for intense sequences of violence and action, and brief sensuality, Snow White and the Huntsman isn't for kids. There are a couple of mild obscenities, but what really makes this inappropriate for young children is the gore and the scary images throughout the film. Parents, don't take your kids to see this thinking it's another Walt Disney fairy tale. Love Theron, love fairy tales (on the written page), but there is no way I’d ever consider seeing this one or (Red Riding Hood). Kristen Stewart must be the least deserving flavour of the month ever. It’s not often that a movie leaves me completely annoyed. This one did. It was my husband’s idea to see SWATH. I was surprised when he invited me because I know he’s not a fan of Kristen Stewart since Twilight. He thought SWATH would be a cool action movie. I confess I thought there would be some romance and also because I thought it would be a cool action movie. …We sat through the whole thing and we both left the theater shaking our heads in disgust, especially at Charlize (who we both normally respect as an actress). Neither one of us enjoyed it like we thought/felt we should have. (Although I did like how Snow White is awakened. Different than Disney.) Anyway, my husband actually offered me an apology and took me out for ice cream to make up for it.